Oct 3, 2017 | eNews Etc. September has been an interesting month weather-wise. We began with clear days and then the wind shifted, bringing the worst smoke we’ve ever had. 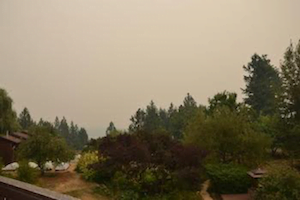 The smoke was from the raging forest fires in Montana and B.C., Canada, as well as from Oregon and Washington State. While we prayed for those in Texas and Florida who were inundated with water, we wished they could send it up here to extinguish the forest fires burning in the western U.S. Fortunately for us, towards the end of the month, the winds changed and the weather cooled. Our prayers are with those in Puerto Rico, Dominica, Mexico City, and other places hit by natural disasters. See Abbey life photos here. 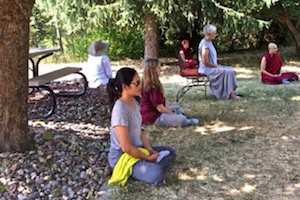 The Concentration Retreat held over the Labor Day Holiday was full of sincere practitioners who wanted to learn how to deepen their meditative concentration. Ven. Chodron gave instructions on the preliminaries to establish before engaging in retreat to gain serenity (shamatha), the five hindrances to overcome in the process of improving our concentration, and how to bring balance to the body, breath and mind. You can watch the teachings here. People practiced both sitting and walking meditation during this silent retreat. It was wonderful watching people relax more and more as the weekend went on. See photos here. 56 people attended, making this one of the largest retreats we’ve had at the Abbey. We’re getting the message that soon we’ll have to build a temple to accommodate the increase in people interested in the Dharma. 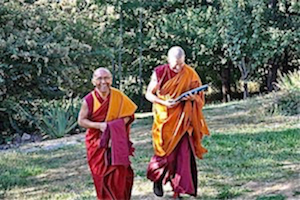 Geshe Dadul Namgyal kindly accepted our invitation to teach at the Abbey once again, this year teaching on Madhyamaka Through Metaphors, complete with teachings on the supportive practices of cultivating the determination to be free and generating bodhicitta. Watch the teachings here. Geshela’s command of English—complete with knowing slang and figures of speech—enables him to communicate the Dharma in a direct way that resonates with Western culture. 40 people joined the four-day course, and Q & A sessions continued after meals and in break times as Geshela generously shared his time with interested students. See photos here. 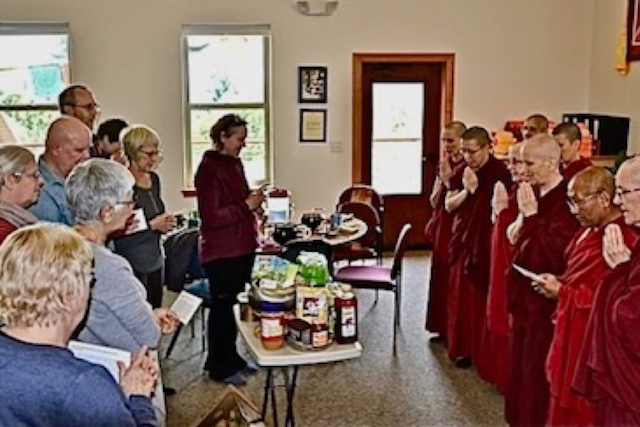 On a bright September morning, temporarily free from the smoke of forest fires, about 30 people gathered to learn about compassion from An Open-Hearted Life that Ven. Chodron co-authored with Dr. Russell Kolts. The chapter covered the importance of compassion in our personal lives and in our social, national, and international interactions as well. We depend on others for everything we have, know, and do, so isolating ourselves from them with self-centeredness does not work as a strategy for happiness. In other words, kindness towards others goes a long way in creating cooperation whereas self-centeredness and hostility only brings more of the same back to us. Indeed, it is not survival of the fittest, but survival of the most cooperative. Watch the talk here. Ven. 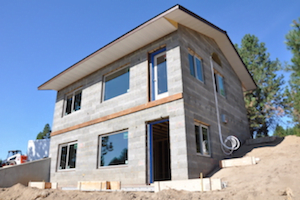 Samten has been making videos of the construction of Prajna House. Watch the faswall blocks being laid to form the walls and the trusses lifted to make the roof here. The windows and doors are in, the roof is on, and the solar panels on the roof are in place. Watch a video about the installation of the solar panels here. Eric is working on the deck now, and as soon as the electrical inspector gives the okay, he’ll be able to start on the internal walls. See more pictures of Prajna House here. Vens. Semkye and Tsepal are wrapping up a four-week series at Create Center called “Developing a Compassionate, Open–Hearted Life.” The evenings comprise meditation, teaching, and discussion based on An Open-Hearted Life. A small but receptive audience said they enjoyed learning more about compassion, its benefits, and tools for developing a sustainable open-hearted and compassionate approach to life. Vens. Tarpa and Semkye responded to a request by Professor Michael Hazel, the Chair of the Communication and Leadership Program at Gonzaga University, to speak to a class of graduate students. Ven. Tarpa began the class with mindfulness meditation on the breath and setting a motivation, before sharing on the various kinds of mindfulness meditations. It was helpful for the class to understand that there are different motivations for doing mindfulness practice, different objects to focus on, and different results. Addressing the leadership aspect, Ven. Semkye shared the Buddhist view of compassion and its benefits, as well as a personal list of some of the ways compassionate leadership has helped her role as offering service facilitator at the Abbey. A meditation on compassion followed and the class was invited to comment and ask questions, which brought an engaged exchange. Ven. Losang met with the Buddhist group at Airway Heights Correctional Center, where he shared from Ven. Chodron’s book Good Karma: How to Create the Causes of Happiness and Avoid the Causes of Suffering, a commentary on the poem “The Wheel of Sharp Weapons.” The teaching was followed by a lively discussion and Q & A.
Vens. Jigme, Samten, and Damcho keep up the Abbey’s long-standing connection with the Unitarian Universalist Church through its Monday night meditation group. Now in its ninth year, the convivial community continues to welcome new people each week. The sessions open and close with guided meditations, and are currently focused on Ven. Chodron’s Working with Anger, which open up rich discussions on dealing with difficult situations on the personal, national, and global levels. Ven. Chodron spoke at the Sunday service at the Gardenia Center, basing her talk on the hymns they sang during the service. One concerned reaping what we sow—karma and its effects—and another encouraged us to be strong, true, and compassionate. People appreciated having the meaning of the hymns unpacked for them. 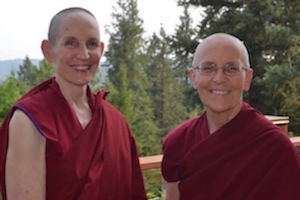 From January 22 to February 8, the Abbey is hosting Living Vinaya in the West, an educational program for nuns living in the West. Taught by Venerable Bhikshuni Master Wu Yin from Taiwan, this is a rare opportunity to learn the monastic discipline from a well-respected bhikshuni who has hundreds of disciples. She will emphasize the practical aspects of Vinaya and how to live it in our times and cultures. We would also like to invite those of you who would like to help sponsor this special event to do so. Please write “Vinaya course” in the comments box. The wish list also contains items we’ll need for the course. And if you’d like to get to know an incredible group of women in the Dharma, volunteer to help serve the course. Due to the kindness of many volunteers, we accomplished a lot during our September Offering Service Day. 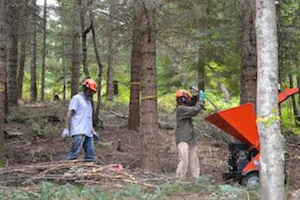 One team worked with the chainsaw, handsaws, and loppers to thin the forest and take out debris. Another team worked in the garden, picking and then drying herbs, and others helped in the kitchen. Join us for the next Offering Service Day on October 7. Meanwhile the Abbey residents and guests work in the forest on other days; it’s a fun activity and a good break from computer work. We’ve had several long-term guests—Ryan, Toji, Matt, Karin, Brooke, and Jazz—who enthusiastically work with Vens. Losang, Semkye, and Tsepal in the forest. As a result, we’re making good progress in thinning and removing debris and discovering beautiful areas of the forest we haven’t been able to walk in until now. These guests are sincere in learning the Dharma, so many good discussions ensue while they offer service. 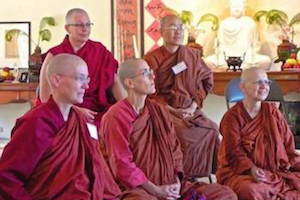 Many of us at the Abbey are involved in helping prison inmates who want to learn the Dharma. In doing so, we’ve learned a lot about the “justice” system in the U.S.
One of the people whom we admire who is trying to make the justice system more just is Bryan Stevenson, the author of Just Mercy, a fascinating and true story of his work. He has also given a TED talk that shows the importance of having a heart when working in this field. Watch it here. Watch this five-minute video by Rev. William Barber about structural racism and how we can move forward. Ven. 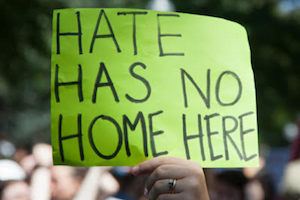 Nyima shares her thoughts on “Overcoming Anger towards Those Who Use Hate Speech,” a timely topic. Ryan, who is staying at the Abbey for a few months, wrote a great piece on how Buddhists can work the 12 steps of AA. Ven. Chonyi guest edited the Summer 2017 issue of American Buddhist Women, which features interviews with Buddhist nuns based in America who were recognized last year at the Global Bhikkhuni Awards in Taiwan, and also with one of the first female Geshes. Learn about these inspiring women here. Read an interview with Ven. Chodron here and an essay by Ven. Damcho here. More information about the history of fully ordained nuns can be found here and here. The eBook edition of Ven. Chodron’s book, Buddhism for Beginners, will be available during the month of October at the promotional price of $1.99 at Kindle, iBooks, Nook and and Kobo. Get your copy today! For the tech-savvy, Ven. Chodron’s guided meditations are available on the Insight Timer app, which functions as a meditation timer and offers a library of guided meditations. The next semester of Sravasti Abbey Friends Education (SAFE), our online distance-learning program begins November 6. Write safecoordinator [at] gmail [dot] com to register.